I knew exactly what I was getting into with this guide. Sam Wilson is a Marvel character who has been around for 50 years and has spent the vast majority of that time as a supporting player. I could easily work out his continuity order, but there was no shortcut to explaining his many stories other than just reviewing the comics. Unlike some of my other solo hero projects this year, I was eager to dive in and better understand Falcon’s lengthy Marvel history. That has a lot to do with my reaction to Wilson in the role of Captain America, which he served from 2014 to 2017. I was slow to catch up with the initial run of Rick Remender stories of Sam as Cap prior to Secret Wars. I had literally never read a Falcon comic outside of his scant Avengers appearances and his co-star turn in Captain America following the death of Steve Rogers. This was the guy who talked to birds, right? Why would I be interested in reading him as Marvel’s greatest hero? It only took a few issues of Remender’s run to change my mind. He quickly became my Captain America, and that made me want to understand everything that brought him to that point. Sam Wilson’s story begins in 1969, when he was introduced as just the second major black Marvel hero, on the heels of Black Panther in 1966. If Black Panther joining the Avengers in 1968 was progressive, Sam Wilson sharing the title of Captain America’s ongoing comic in 1971 was revolutionary. While Wilson was frequently a vehicle of some jive-talking tropes of the 70s, he was also authentically connected to the voice of common people in the midst of his high-flying adventures with Cap. He also was an imperfect hero – often rash, brash, and needing an attitude-check from Cap. That changed over time, especially as Wilson hung up his Falcon wings and made a failed run for Congress at the same time as he merited his own solo mini-series in 1983. That marked the start of a long period of less-regular guest appearances for him, but there’s the sense that it was because he graduated from being Cap’s pseudo-sidekick into being his own fully-formed hero – just not one who could hold down his own solo title. Part of Wilson’s relative lack of appearances is the fact that Falcon has always been a reluctant and short-lived AvengerCap first recruits him in 1979 as a literal “diversity hire,” a token black member so that the Avengers don’t lose their charter. Wilson chafes as the designation, and quits as soon as it won’t endanger the team. He’s roped back in by Cap as a reservist in the 80s and 90s, and a full-time member in the 00s and 10s, but it’s always a brief membership up until he becomes Captain America in 2014. Sam Wilson was a different kind of hero than Sam Rogers, partially because he was a different kind of underdog than the formerly-scrawny patriotic kid with infinite bravery. Here was a black man becoming the ultimate symbol of America even as some people (both in-universe and in the real world) questioned whether he could represent all Americans. He was used to being a hero, but not the hero – one who was always the main target, and whose every move was dissected. While Wilson fought enemies he was busy second-guessing his every move and dissecting his every shield throw. While I didn’t realize it in 2014, Sam Wilson was a perfectly apt symbol for the times as a hero with deep roots in Harlem and a history as a social worker, community organizer, and congressional candidate. Now, having browsed all of his history, the connections between his decades-old stories and the more-recent history of President Obama are not lost on me. Even without that context, Wilson resonated for me Captain America in a way that Steve Rogers never did. I was genuinely sad to see his run come to an end in 2017. 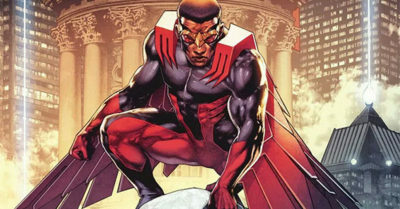 I’m happy to point out that Falcon was the last of the series of the tricky Marvel hero guides I’ve been wrestling with since early this year (the others were Vision and Ant-Man). While just about any hero I cover from here on out will have mostly been a team player or guest star by definition, none have quite the lengthy history and plot development of this trio of characters. Want access to this guide today? It’s available in exchange for covering $1.99 a month of CK’s hosting expenses. Those “Pledgeonaut” Patrons now have access to 31 exclusive guides – 1 guide per dollar of pledging per year at the Pledgeonauts level!